Hey everyone, new to this forum. I recently acquired this Tokai Butterscotch Telecaster. I'm having a difficult time identifying if this one was made in Japan or Korea, and what year it was made. Can anyone help me out? I've included photos, let me know if you need any other photos to help solve this mystery. 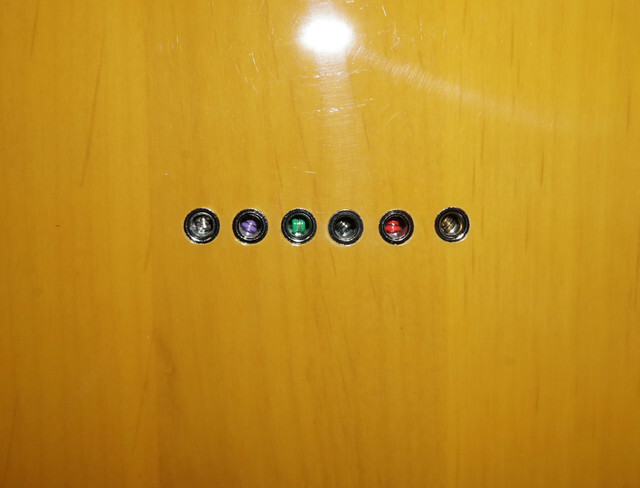 It has all different colored springs, which I've never seen before either. Any help would be appreciated, thank you! Also, I am looking to sell this so if you have an idea of its value that would be appreciated too! The colored string balls are D'Addario brand. My fave. They are cool! After digging a bit deeper in the the Dating & ID Section, I see that the Korean models have a serial number that starts with a letter, and they reference A, B, C. But it doesn't mention anything about an F serial, or about a Goldstar Sounds model. This is what has me so confused. If I recall correctly, the Korean models had a gold Made In Korea stamp at the base of the headstock on the back. My guess is that this one might be made in China? Perhaps someone else might be able to assist. Hi,this guitar is a fake unfortunately. Tokai has never produced a Goldstar telecaster. Lol. Thanks for the backup marcus. I've sent a message to tokaiguitar.de. Hoping they get back to me and help solve this mystery. bluejeannot is a very informed, friendly and great forum member. My comment and links were just out of surprise because like others, I was almost certain that there were some Korean made Goldstar teles in the early 2000's - only for a couple years. But I've never seen one with a serial number like yours - hence my guess was China. Now whether it's a licensed Tokai, that's another story. At least I'm certain of what the strings are. I would be surprised if it was a fake, but I can not rule it out for certain. I have a pawn shop in philadelphia and I bought this guitar as part of a larger collection. The collection consisted of vintage martins, gibsons, custom acoustics from luthiers such as John Kinnaird and Don Wilson, and more very high end stringed instruments. However, there were a mix of 2 or 3 lower end items like a couple Fretlights. The previous owner had excellent taste so I just can't imagine he'd buy a fake Tokai, unless it was a mistake or he just simply liked this particular one. Feel free to check out our current items! "OK, MIJ Tokai have always used the name Breezysound for their Telecaster copies (great guitars, especially the early ones 1978-83ish). The Korean operation seems to have some sort of legal agreement with Japanese Tokai, but otherwise appears unconnected. And now seems like some Korean makers are building guitars just according to requests from individual small dealers/shops, which seems to me unlikely to be sanctioned by MIJ Tokai … heaven knows who’s building the recent so-called MIK “Tokais” now on sale in Canada. I think that’s where the confusion arises & where the Goldstar name has appeared quite wrongly on Telecaster copies … it’s like someone in Nigeria copying Fenders and putting name Stratocaster on Tele shaped guitars. Does that answer the question? Tiddles, Jul 8, 2005 #6" From the Telecaster forum. A representative of the company responded to me. I gave him photos and the serial number. It is a Chinese model. I inquired about why it says goldstar, he said some were produced that way. So it is not fake, but it is also not what I was hoping for lol. As much as I respect Gottfried's opinion on most things Tokai, I think that he is wrong on on the question of this so called "Goldstar" tele. The first reports of of these mis labled Teles date from the early 2000s there have been very few since, leading me to the conclusion that these guitars were made in the early to mid 2000 time period and not later. The budget Tokai teles to my knowledge were not manufactured in China at this date, but were, as is generally aknowledged, manufactured in Korea. Futhermore 215 collector's Tele has the 3 saddle bridge,whereas the Chinese ATE52 tele from the Tokai catalogue has a six saddle bridge,as has the Korean tele in the Reverb ad. 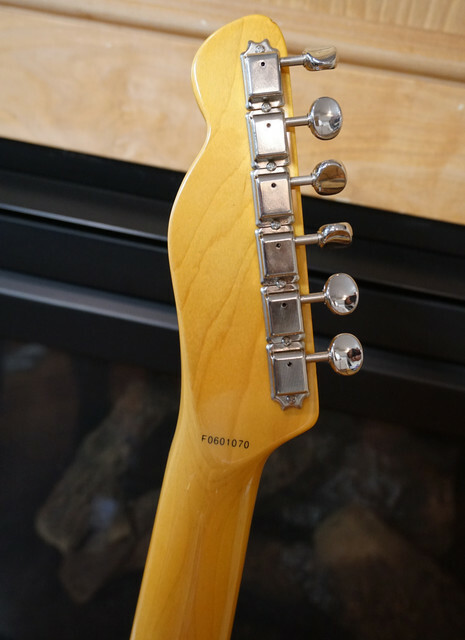 This not definitive proof, but it pretty strongly suggests to me that your guitar was made,as has been suggested by rogue Korean manufactures maybe after their legitimate association with Tokai had ended and without authorisation from Tokai .It is significant that the authorised Korean teles serial numbers terminated at the letter E prefix ,whereas this rogue Goldstar tele,s serial number starts at F.(one year later?) 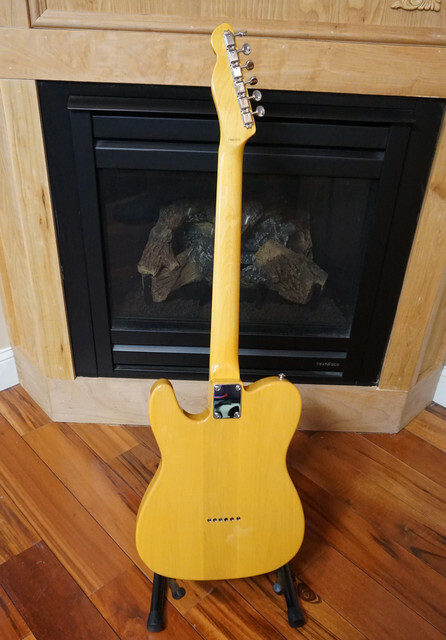 This unauthorised production mirrors the way in which the notorious Canadian Dillion Fakais were produced in roughly the same era.As the wording of the ad from Reverb states, "Tokai Goldstar Sound 50's Tele-Style Guitar in a beautiful Butterscotch finish w/Tinted Maple Neck...w/Maple Cap Fingerboard , has that '52 Vintage Reissue Telecaster Vibe! all the way at a much more affordable price. Manufactured in Korea (2002-2003) no longer produced. 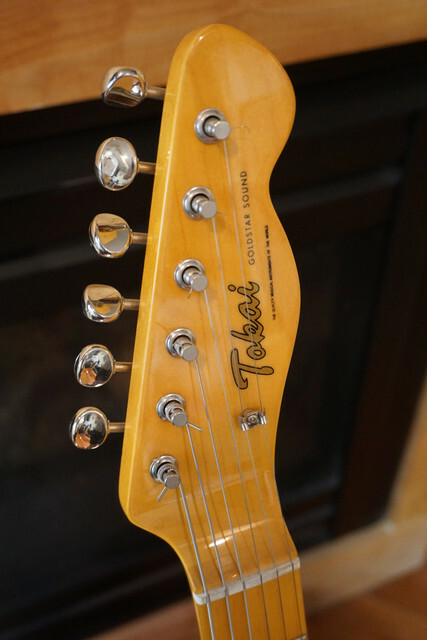 This Tokai is in NEW condition or should I say New-Old Stock, and it has been tucked away for years with no issues whatsoever. The plastic film is still on the pickguard. Tokai Guitars have been regarded as fine quality built instruments throughout the industry for many years. Included is a New Fender Standard Gig Bag and a set of D'Addario Strings. These Tokai guitars are very hard to find especially in this condition. 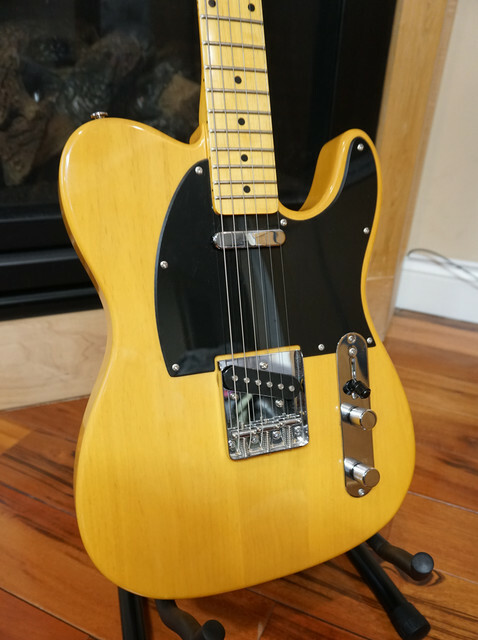 ***IF YOU LIKE FENDER, TRY ME***".I think that your Goldstar tele is from Korea like the one in the Reverb ad to which it bears a striking resemblance,(even down to the 3 saddle bridge,maple cap and the Daddarios!) and was manufactured a year or so after the official licensed Korean Tokais ceased production in the early 2000s and so is to all intents and purposes, a fake. As much as I respect Gottfried's opinion on most things Tokai, I think that he is wrong on on the question of this so called "Goldstar" tele. I actually have a Love Rock from around the same time period which Gottfried has insisted is a fake when it quite clearly isn't (it's got some unusual specs but it was in regular production). No disrespect intended to him but it would appear he may have a blind spot for these years.